For employees to gain insight into company goals, objectives and strategies. For senior leaders to create a shared space for employees to discuss career progression, professional goals and give feedback. Who controls the skip level meeting agenda? The best skip level meetings happen when both employees and senior leaders contribute to a shared agenda. And in terms of timing, most skip level meetings are 30 to 45 minutes on a bi-monthly or monthly basis. While the meetings might be shorter than a typical one-on-one, the impact is tremendous (when done well). Click here to jump to the SoapBox skip level retrospective meeting agenda template! 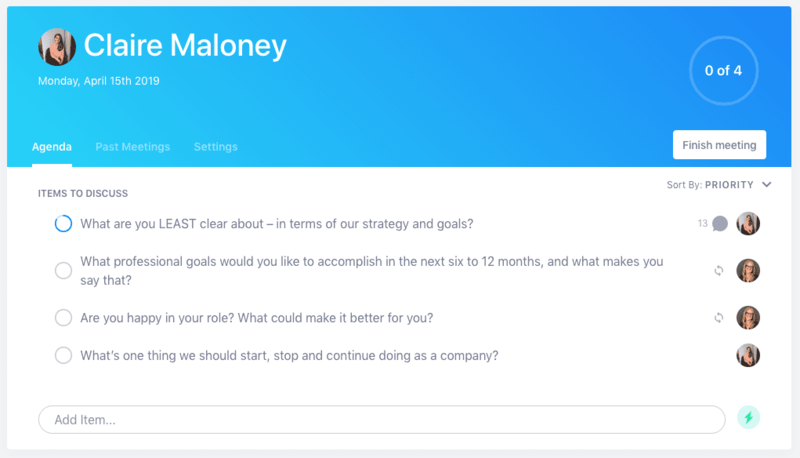 What are you LEAST clear about – in terms of our strategy and goals? What professional goals would you like to accomplish in the next six to 12 months, and what makes you say that? Are you happy in your role? What could make it better for you? What’s one thing we should start, stop and continue doing as a company? What is everyone around me neglecting to share with me? What’s one thing we could do as a company that would impact your personal life? What’s one thing we can do to improve the performance of the team? Who is one person in the company that you’d like to learn more from? Is there anything that would be productive for me to re-explain to your team? How do you feel about the balance between your individual work vs. managing? Do you have any questions that, if answered, would help you in your day-to-day? Avoid using skip level meetings to get feedback from employees on their direct managers. That kind of feedback should be brought up between the direct report and manager directly. Skip level meetings aren’t intended for senior leaders to spy on managers and their teams, but rather share high level strategy and connect with employees they might not connect with regularly otherwise. This is your opportunity to gather useful information on how things are going, straight from the front-line. During this time, do your best to learn how engaged your employees are, and how this is impacting effectiveness – in other words, get the information that isn’t always readily accessible to leaders. Be thoughtful around how employees might feel, and aware that he/she might have difficulty sharing opinions and being vulnerable with you. It’s your job to make sure you foster that environment both by setting the pretext for your one-on-one before and during your meeting. Use your time wisely. This is the chance for prized time with a leader you otherwise might not have access to. Use this as an opportunity to learn and prepare by reflecting on your journey at the company and what you want your future with the business to look like. Prepare by thinking about what you want your leader to know about you personally and professionally and by thinking about unique questions you can ask to learn more about the business.